It’s been a while since Jeep has bought out a new Wrangler, so the 2019 Jeep Wrangler is nabbing a bit of off-roading attention – and as well it should be because few vehicles in the 4×4 arena are able to match the Wrangler for ultimate 4×4 fun. Let’s see what we can expect. So to look at the new Wrangler has similar styling to the one it replaces but it has been totally redeveloped. You can still unbolt the doors from the outside and fold the front windscreen down towards the front. Though if I left my wallet in the Wrangler my first thought would not be to unbolt the doors! Exterior detailing has been modernised with some eye-catching signature DRLs and LED lighting. The essence of the Wrangler exterior still keeps the iconic Jeep look, which in my book is super cool. But hop into the interior and you’ll find that the rugged styling has been tickled up with some excellent modern features like rubber surrounds for the central touchscreen display, rubber switchgear, and even the start button has a rubber surface. 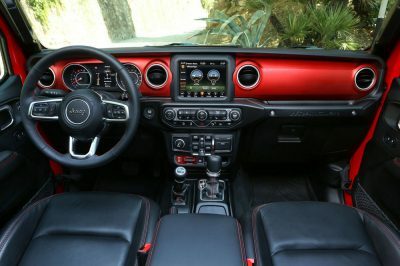 The Wrangler’s interior quality is nice and there are more storage compartments for cabin storage space. 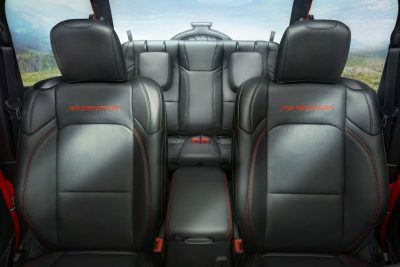 Rubicon models enjoy some premium leather seats which look and feel great. One of the key upgrades includes a brand new 8.4-inch Uconnect infotainment system as standard, as well as a 7.0-inch colour driver’s instrument cluster. The infotainment system boasts the all-important Apple CarPlay and Android Auto, USB connection points are present alongside electronic accessory jacks in the centre dash, rear USB points, directional air vents in the rear, and isofix child seat mounts in the rear. DAB radio, sat-nav and Bluetooth all feature on the base model standard list, which also gets 18-inch alloys, keyless entry-and-start, and a powerful air-conditioning system. Comfort wise the seats are great, and the room front and rear is good. The five-door Wrangler can seat five adults, with plenty of luggage space for carrying all the picnic goodies in the boot. The short-wheel base version is equipped with just the four adult seats due to the small wheelbase. But if you’re having to turn around on a forestry track with cliffs on both sides, the smaller wheelbase is the model you’ll be wanting to be performing the manoeuvre with it tighter turning circle. On the tailgate the spare wheel is mounted, and in typical Jeep Wrangler fashion, the rear window is separate from the horizontally opening tailgate. Like before, the Jeep Wrangler is available in either three or five-door bodystyles, but there’s now the option of a V6 (150 kW, 450 Nm) 2.2-litre turbo-diesel engine, a turbocharged 2.0-litre (203 kW, 400 Nm) petrol, and a 212 kW/347 Nm V6 3.6-litre petrol. All models are pretty peppy and, though thirsty, the 2-tonne 3.6-litre Rubicon is actually pretty quick and can scamper through the 0-100 km/h in less than nine seconds. If you can, try the new eight-speed auto which does the job very nicely and is also a relaxing drive. Off-road, the Jeep Wrangler is in its element. Solid axles front and rear cope with anything the terrain throws the Wrangler’s way. 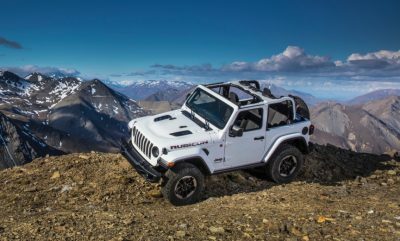 Coil springs all around maximise suspension articulation, so you’ll be amazed what the 2019 Jeep Wrangler can climb over. Rubicon models get beefed up rear suspension components, loads of power, sway bars and electronic diff locks to really show off! High and low range are standard Jeep Wrangler 4×4 features. Indeed, this latest Jeep Wrangler has been treated to new styling all-around, a more luxurious and practical interior, new engines, a new infotainment system and a suite of the latest safety systems to that impress. Advanced safety systems such as blind spot monitoring and rear cross path alert are now available on the Wrangler models. Rock up in a new Jeep Wrangler and you know you have arrived. This is a machine with bucket loads of road presence; and when you’ve had enough of the goggle-eyed looks, just pull off the road and take the roads less travelled! 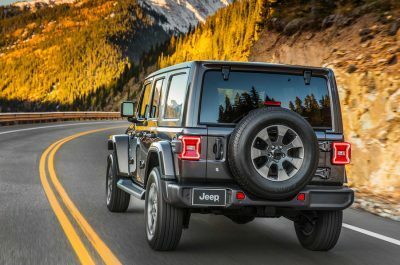 For any more information on the Jeep Wrangler models or, for that matter, any other new car, contact one of our friendly consultants on 1300 303 181. If you’d like some fleet discount pricing (yes even for private buyers! ), we can submit vehicle quote requests out to our national network of Jeep dealers and come back with pricing within 24 hours. Private Fleet – car buying made easy!